A visitor looking at multi-media tems during an exhibition inside late Yugoslav communist leader Tito’s famous ship Galeb (Seagull) in Croatia’s main harbour of Rijeka. Teh items are on display on three of the yacht’s five decks. An exhibition in Croatia showcasing artworks banned by 20th century totalitarian regimes has lifted out of oblivion a powerful symbol of socialist glamour: Former Yugoslav leader Josip Broz Tito’s famous Presidential yacht Galeb. “We were looking for an attractive space to be a counterpoint to the art that we represent,” said Branko Franceschi, the curator of the At A Standstill exhibition aboard the 117-metre Galeb (Seagull in Croatian) ship. “We realised that the Galeb was perfect. Built in 1938 in (fascist leader Benito) Mussolini’s Italy, in a totalitarian society that marked the first half of the century, it gained world fame as the ‘sailing office of Marshall Tito’, in another totalitarian regime,” he added. 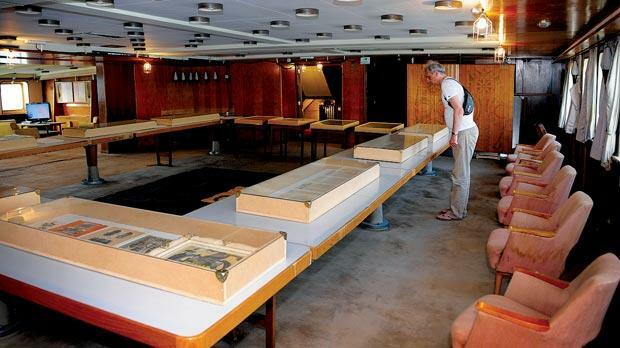 Some 200 multi-media items – photographs, posters, books, magazines, video and audio footage – of around 60 artists mainly from the former Yugoslavia, but also from central European countries, the former Soviet Union and Japan, are exhibited on three of the yacht’s five decks. The exhibition covers the period from the 1909 founding of Futurism – an international art movement that rejected romanticism and celebrated technology – to the 1989 Fall of the Berlin Wall. The works, from the private avantgarde art Collection Marinko Sudac, were “actually created as opposition to totalitarian regimes, notably those social and political systems that Galeb represents”, Mr Franceschi noted. 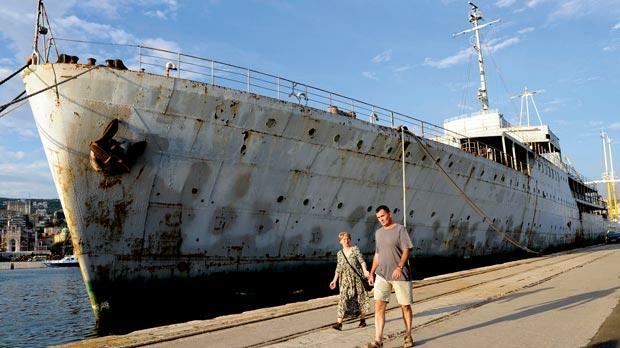 For the occasion, the “Peace Ship”, as the Galeb was called during Tito’s time, was towed to the port of this northern Croatian town from a nearby shipyard where it had been languishing for decades. It has not fared well since its heyday. Once used to entertain more than 100 world leaders such as Nikita Khrushchev, Col Gaddafi and Indira Gandhi or movie stars like Elizabeth Taylor and Richard Burton, the Galeb is now a rusty hulk. The yacht first came to world attention in 1953 when Tito sailed up the Thames in it to meet Winston Churchill on the first visit to Britain by a communist head of state. The late leader also used it to visit several nonaligned countries around the world. “Visitors are more interested in the ship but they like the whole concept. They want to know what will happen to the Galeb,” said volunteer Ivana Galeb, an art student. Part of the exhibition is dedicated to the yacht itself showing footages of Tito and plaques made for visits by world leaders. Some sections of the yacht are open to visitors, including the bedrooms used by Tito and his wife Jovanka, a conference room and guests’ cabins. Originally built to transport bananas, the Galeb was converted to an auxiliary cruiser by the Germans during World War II. Sunk in the allies’ bombing in Rijeka in 1944, it was later salvaged and repaired to become Tito’s Presidential yacht.